Every year on January 15, we celebrate Wikipedia’s birthday. It takes thousands all around the world to make Wikipedia the resource that it is; Wikipedia Day is a great time to recognize all that hard work and successful collaboration. It’s also a day to speak to the importance of freely available knowledge and to continue conversations about how we can further Wikipedia’s purpose as a community. 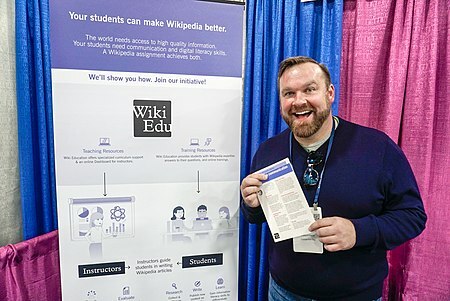 On Wikipedia’s 18th birthday, we’d like to share what Wiki Education has been up to over the last year to help achieve the vision of a world where everyone has access to free, accurate knowledge. We announced our new strategy, which will shape our work for the next three years. We will increase knowledge equity by focusing on content and communities that are underrepresented on Wikipedia and Wikidata; provide people who seek knowledge online with accurate information in topic areas that are underdeveloped; and reach large audiences with free knowledge by making Wikipedia and Wikidata more complete. Part of our new strategic direction also includes the development of Wikidata-focused programs. We kicked off this program development with a visit to Wayne State University, where we are beginning a collaboration with the School of Information Sciences around integrating Wikidata assignments into the curriculum. We also attended WikiCite, where we had great conversations about the amazing work that’s happening globally related to citations, open knowledge, and structured data. 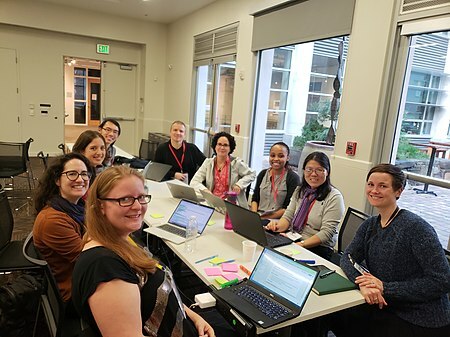 We were thrilled to launch our professional development program this last year, a series of courses for academics, researchers, and other scholars to learn how to contribute their expertise to Wikipedia. Our approach was featured in William Beutler’s “Top Ten Wikipedia Stories of 2018”. It’s a model that offers a potential solution to engaging more academics and subject-matter experts in Wikipedia editing. These professionals target highly trafficked, complex topics that student editors don’t necessarily have the skills to tackle in our Wikipedia Student Program (formerly named the Classroom Program). And so far, we’ve received a lot of positive feedback from course participants about the value of the collaborative learning experience. It seems the rest of the Wikipedia community is as eager as we are to see where the venture goes. We supported more instructors and student editors than ever before in our Wikipedia Student Program. More than 16,000 student editors added more than 13 million words to more than 16,000 articles on Wikipedia, our highest numbers to date. Our partnership with the National Women’s Studies Association (one of the many academic associations we work with) was featured in the Chronicle of Higher Education last March. The article shows the impact of our efforts so far to engage women’s and gender studies students around the country to channel their classwork into the public resource that is Wikipedia. Since 2014, the partnership has yielded more than 4.4 million words added to Wikipedia to help close the gender gap. We also hit a major milestone last April: student editors in our Wikipedia Student Program have officially contributed more words to Wikipedia since our program’s inception in 2010 than were published in the last print edition of the Encyclopædia Britannica. Executive Director Frank Schulenburg wrote about the significance of this milestone in the context of encyclopedic history and conversations around open access. We continually seek feedback from the thousands of people that use our Dashboard so that we can improve it to fit new and changing needs. A portion of these continual improvements are made through our tech mentorship program, which engages new coders in our open source project. An example of a great feature to come out of one of these mentorships last year is Google Summer of Code student Pratyush Singhal’s Article Finder. This is a tool on our Dashboard which will help newcomers find Wikipedia articles in need of development in an automated, straight-forward way. We also embarked on an exciting new journey for our software development team. Chief Technology Officer Sage Ross hired Wes Reid as our new Software Developer. The expansion of our tech team will allow for more integral changes to our Dashboard in the near future, enabling the thousands who use it worldwide to learn Wikipedia editing and track their contributions with more efficiency. We attended numerous academic conferences this year to invite instructors and researchers to join our programs. Multiple alumni from our professional development courses presented with our staff at these conferences, speaking to the skills and enthusiasm that the experience fostered. Participating instructors in our Wikipedia Student Program presented about incorporating Wikipedia editing into their curricula, as well. Dr. Jenn Brandt presents at NWSA’s annual meeting about her experience in our professional development course. Alum from one of our professional development courses visits our booth at the National Communication Association annual convention. 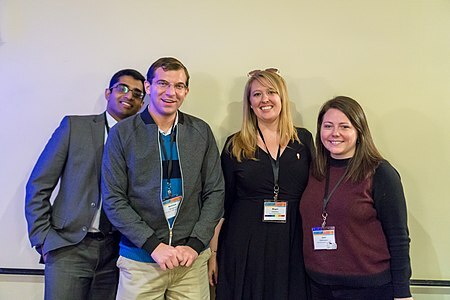 At the Midwest Political Science Association’s annual conference, Director of Partnerships Jami Mathewson served as discussant alongside three instructors who are teaching with Wikipedia: Dr. Jinu Abraham, Dr. Matthew Bergman, and Dr. Megan Osterbur. We also had the privilege of attending multiple Wikipedian-centered conferences and events last year. In April, Executive Director Frank Schulenburg and Sage traveled to Berlin to participate in the annual Wikimedia Conference. It was a great opportunity to join other leaders of the global Wikimedia movement both to speak to the present and future of the global Programs & Events Dashboard that we maintain and discuss the strategic direction of the Wikimedia movement. 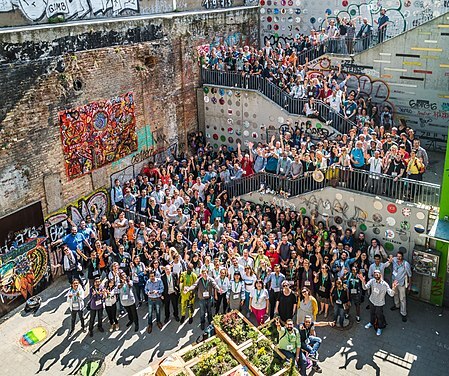 Group photo at the Wikimedia Conference 2018 in Berlin. Image: File:Wikimedia Conference 2018, Group photo.jpg, Jason Krüger, CC BY-SA 4.0, via Wikimedia Commons. 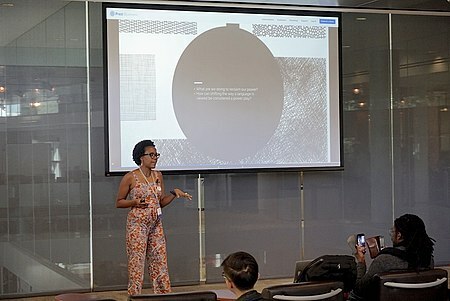 Then, during October, we had a wonderful opportunity to interact with the North American Wikimedia community at WikiConference North America. In attendance were several of our instructors. Both Wiki Education staff as well as instructors in our program gave presentations during the conference, making education one of the most prominent themes of this year’s gathering. 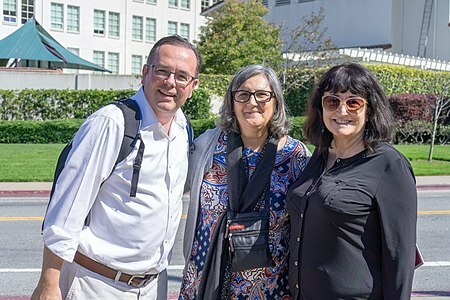 We often see visitors at our San Francisco office in the Presidio, which is a treat for us and a great way to further connect with Wikipedians, instructors, and students who we usually work with only virtually. 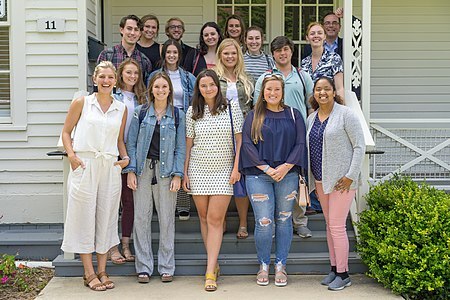 Ole Miss students visit Wiki Education in July to learn what it means to work for a mission-driven non-profit in the San Francisco Bay Area. On the whole, we’re proud of what we’ve accomplished in 2018 and look forward to productive work in the coming year to make Wikipedia even more of a robust and accurate resource for everyone. For detailed reports of programmatic activities and budgeting, see our Monthly Reports published on our blog and on Wikimedia Commons. Header image: File:WikiConNA 18 -WikiEd Group Photo 1.jpg, Sixflashphoto, CC BY-SA 4.0, via Wikimedia Commons.